Smartsheet is used by 96 of the Fortune 100 to increase their productivity. Meeting minutes provide an important record of proceedings, whether it’s for a corporate staff meeting, a board meeting at a nonprofit organization, or an informal committee meeting. Being able to quickly take notes keeps meetings on track and provides a clear summary to those who weren’t able to attend. To streamline the process of taking meeting minutes, simply use a template that is formatted to fit your needs. Below you’ll find a comprehensive selection of free meeting minutes templates for Word. Choose formal or informal, corporate or board meeting, or basic or detailed templates. These templates are easy to use and can also be saved and shared in PDF format. If you're interested in increasing meeting effectiveness and productivity, consider trying Smartsheet. Organize upcoming and previous meetings in one location to improve visibility and increase accountability. Create a seamless, connected meeting agenda where everyone has access and can contribute. Take the guesswork out of managing meetings with automated alerts, notifications and update requests. Document meeting minutes directly in the agenda and attach files and comments to relevant topics and action items. You may want to consider planning and managing your next meeting with Smartsheet, a powerful online task management and collaboration tool. Define meeting goals, map out the agenda, create detailed schedules with discussion topics and presenters. Once the meeting is done, you can upload notes, presentations, and assign action items to a task list. Use conditional formatting for better visibility and automatic notifications for updates and reminders. How would you like to create your meeting minutes? 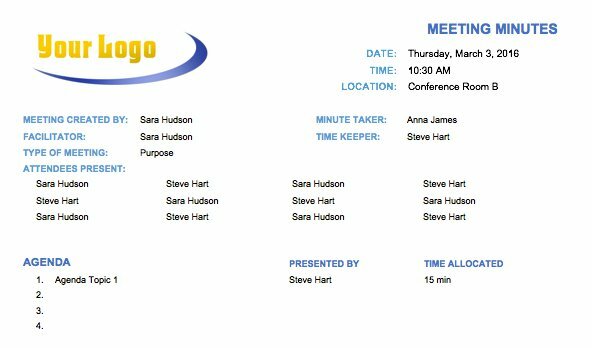 This free meeting minutes template has a classic outline and is simple to use. It’s intended to follow the Robert’s Rules of Order meeting procedures, similar to the formal meeting minutes template below. 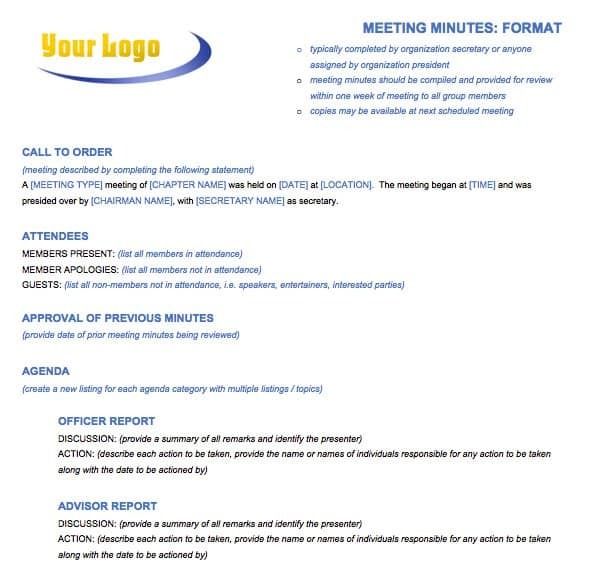 The basic meeting minutes template clearly lists action items and deadlines. This template could be used in a business setting, or for a school, club or any organization with committee meetings. The clear layout makes it easy to see who was running the meeting and what agenda items were discussed. There is also room to list who recorded the minutes, which is helpful when there is not an assigned secretary. 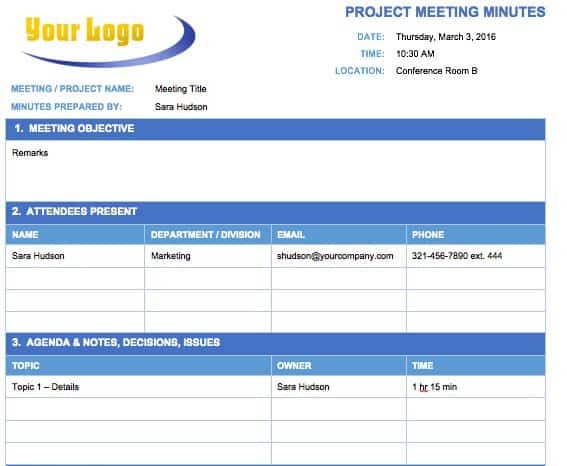 If you’re meeting to discuss an ongoing project, get consistent and organized minutes with this project meeting template. List the project name at the top of the template, along with the objective for your current meeting. 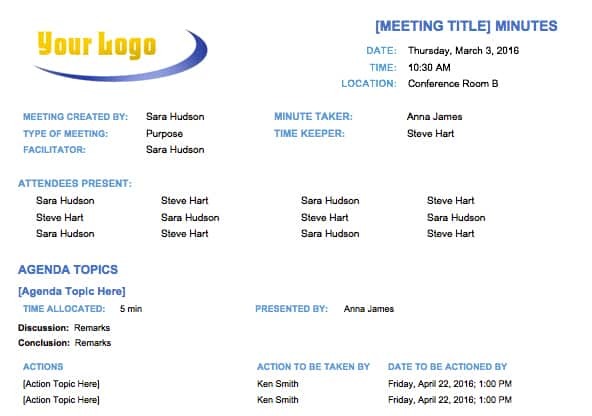 The simple format makes this template easy to read and refer back to, especially for those who were not able to attend the meeting. There is room for action items to be clearly assigned, and plans for the next meeting can be added at the bottom of the template. This template would work well for staff meetings or any meeting that doesn’t require many formal steps or a lot of detailed information. Easily outline your agenda items and then connect action plans to those items once they have been discussed and agreed upon. This formal meeting minutes template follows the guidelines of Robert’s Rules of Order, including the call to order, attendees, reports, announcements and motions that were presented and voted on. After being approved as a record for the next meeting, the secretary can sign and date the minutes at the bottom of the page. This template covers the basics while leaving plenty of room for more detail if necessary. 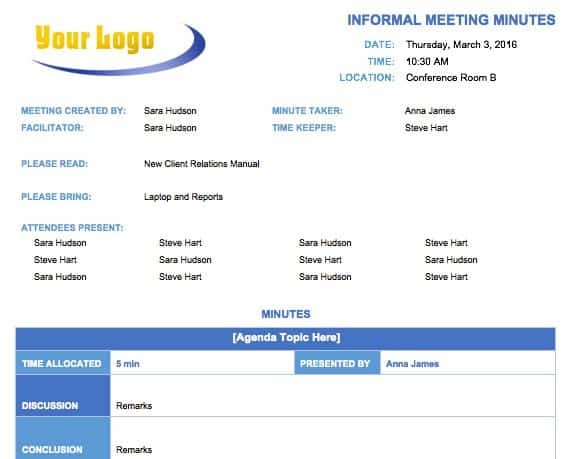 If your meeting doesn’t follow formal proceedings, and your minutes don’t require a lot of detail, this informal meeting minutes template gives you the basics. Having a simple outline to follow is more organized than simply writing a page of notes, and this template can be expanded or shortened depending on your needs. 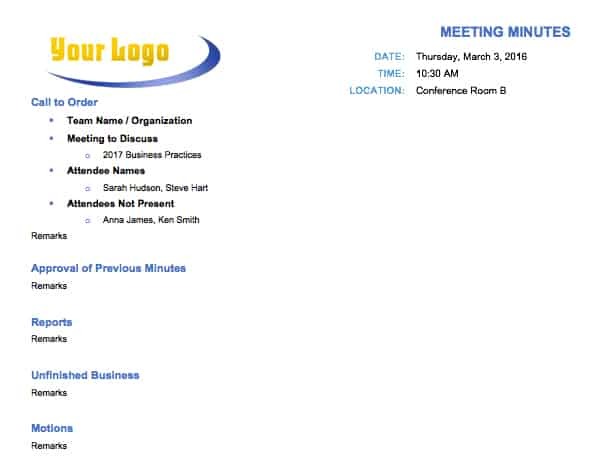 This free template for board meeting minutes allows you to keep track of which board members were in attendance to ensure that quorum is met. And the outline makes it easy to create a detailed record of comments, reports, agenda items and votes. Spaces for signatures are included so that the board chair can approve the minutes. The format of the detailed meeting minutes template makes it easy to record a lot of information in an organized manner. 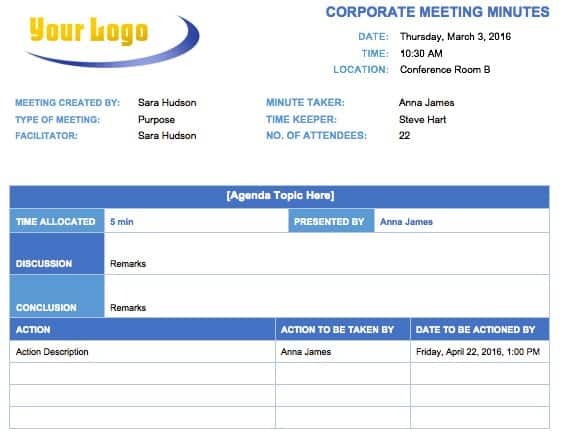 Capture all the important details from your meeting, including additional notes and information that may not fit in the spaces for action and agenda items. Decisions can be clearly listed, and there is room at the top to state the meeting’s objective, helping to keep all attendees focused and on track. 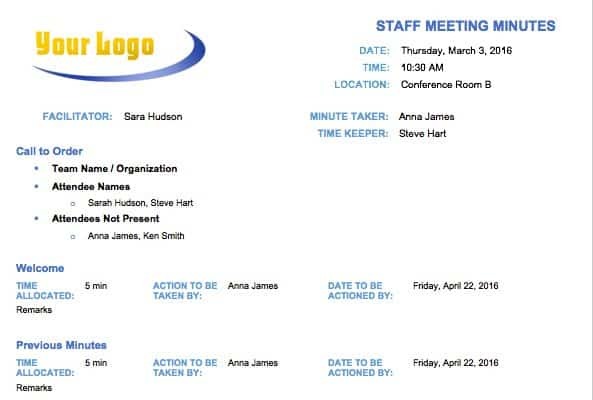 This staff meeting minutes template will help keep meetings organized and on schedule. There is room for the meeting agenda to be outlined in detail, and a time frame can be allocated for each agenda item. Issues raised in previous meetings can be addressed along with new agenda items and information on staff trainings. You can also note which staff members are attending the meeting and who is facilitating. 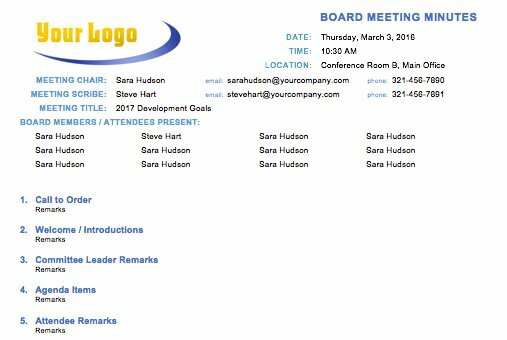 Customize this free corporate meeting minutes template by inserting your company name or logo at the top. The format of this template is bold yet simple, making it easy to use as a reference tool after a meeting. Action items, their owners and deadlines are clearly marked and organized by topic. Providing a copy of the minutes to everyone on your corporate team can help move your objectives forward. This sample meeting minutes format gives you an idea of what type of information to include in each section. It’s a handy template for those who are new to taking meeting minutes and includes enough detail to make sure all aspects of a meeting are covered. 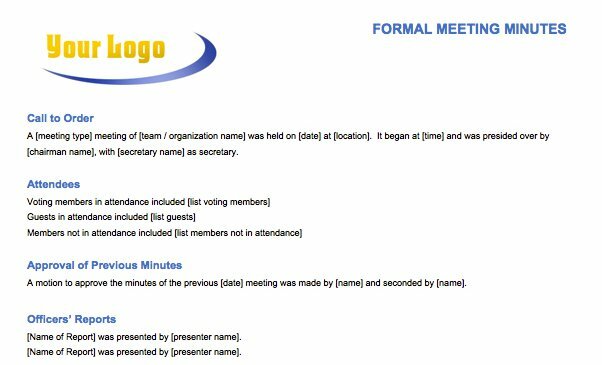 The template includes examples of agenda items as well as instructions for how to distribute the minutes to attendees after a meeting. Running effective, productive meetings is more than having the right template - it’s about having the right solution to manage the details leading up to, during, and after the meeting, including: Ensuring that attendees are prepared to contribute to the meeting, that action items and meeting minutes are documented, and that items are followed up on after the meeting. One such tool is Smartsheet, an enterprise work management platform that fundamentally changes the way teams, leaders, and businesses get work done. Over 70,000 brands and millions of information workers trust Smartsheet as the best way to plan, track, automate, and report on work. Real-Time Collaboration - As a cloud-based solution, Smartsheet enables you to share your meeting agenda with an unlimited number of internal and external collaborators, creating a real-time, collaborative way to plan and track meeting details. 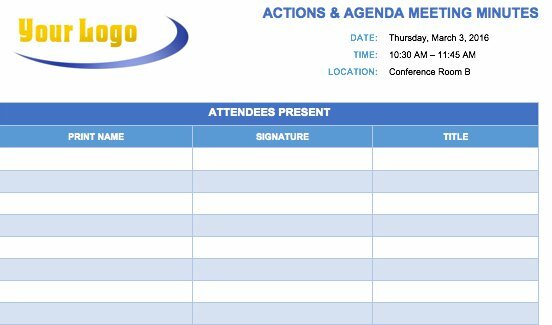 Automated Workflows - Built-in automation helps reduce the time spent on tedious tasks, like gathering meeting details, updating agendas, and notifying attendees when they’re responsible for agenda topics or action items, resulting in greater accountability. Improved Visibility - With meeting minutes and discussion comments documented directly in the agenda, you keep details in context with relevant topics and action items, creating one system of record for all meeting details. Discover a better way to manage meetings and the rest of your work processes with Smartsheet. Whether a meeting’s objective is to make policy decisions that affect a large organization or to simply assign responsibilities to staff members, having concise and organized meeting minutes is important. The minutes serve as a record of motions that were passed and as a reminder of who owns certain tasks. Taking minutes during a meeting might sound overwhelming, but following these guidelines can help the process go smoothly. Plan your agenda. Create an outline around your agenda items and note how much time will be allocated for each item. Brush up on Robert’s Rules of Order. If you’re following formal meeting procedures, choose a meeting minutes template that includes the steps outlined in Robert’s Rules of Order. Check attendees as they arrive. Save time during your meeting by recording attendance as each member arrives. Also note which members are not present. Clarify decisions. Before the meeting moves on to a new agenda item, make sure a clear decision has been made and recorded. Capture the essential information. Don’t try to capture every detail in the minutes, but be sure to include decisions that were made as well as assignments and action items. Using a template for minutes will help you stick to the outline and make sure every agenda item was covered thoroughly. Edit for clarity. Soon after a meeting, use your notes to write out the minutes in a more readable form. Use an objective tone and keep the minutes brief while still including all essential information, such as actions and motions. Summarize any pertinent comment points, but avoid anything personal or inflammatory. Aim to create a professional document that can serve as a record of your meeting. THANKS A LOT THIS REALLY HELP ME BIG TIME=) GOD BLESS! KEEP UP THE GOOD WORK! Thank you so much for sharing these templates, it helped me a lot.